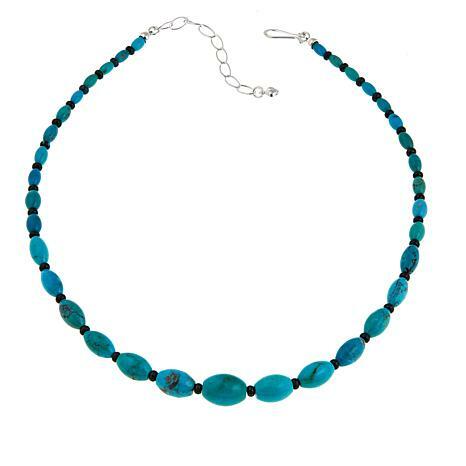 Looking for that perfect turquoise necklace? This beautiful beaded strand just might be it! Iron Mountain turquoise gives you that classic color, while Hubei turquoise lends contrast between the larger stones. A fabulous piece for the turquoise lover! Jay has many unique designs. I like the versatility on this design and the beads are unique, the turquoise color is very nice. 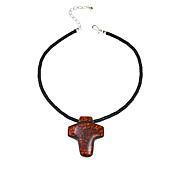 This is a necklace you wear with jeans or a nice dress. 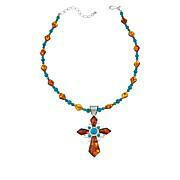 I am a collector of JK's jewelry, mainly turquoise, and this piece does not disappoint. It especially appealed to me because of the Hubei beads in between the Iron Mountain. 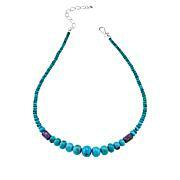 Plan to wear it layered with my JK Hubei turquoise rondelle bead necklace. When I took it out of the box, I noticed that the largest bead in the center has beautiful matrix on one side, but two large white spots (polished) on the other side. Thought about sending it back, but, you know, this is a natural stone...and life is not perfect! Jay, keep up the good work. Looking forward to your shows in February! 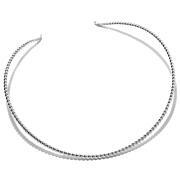 This is a beautiful necklace. Between the blue are little dark beads of turquoise and one of mine was broken. I'm sending this back. I think you should have used something different between the larger beads because apparently the little dark beads are fragile. The broken one was in the bag in pieces. I hope this doesn't end up being sent to another customer. Nice but had to return do to budget. Had to make choices of other JK items.Plus have a long IM in collection. Perfect for graduation gift, too!